The trails get rowdy in Michigan’s Copper Harbor, a tiny town on the tip of the Keweenaw Peninsula with 100 full-time residents. This is the northernmost point in the state, a 50-mile-wide sliver of dirt and rock that curves into the turbulent waters of Lake Superior. There's limited cellphone service, but impeccable mountain biking. Picture sweeping bridges into gap jumps. Picture burly rock drops. Picture berms snaking through hardwoods. Picture flow. Picture speed. Picture giggling through 30 miles of singletrack that strike a rhythmic balance of fall-line descents and flowy contour. You're not supposed to have this much fun in the Midwest, a land ruled by the Lutheran work ethic. It's not in the ethos. "If you have fun, you're gonna go to hell," chuckles Hansi Johnson, who helped put Copper Harbor on the map during his tenure as the Midwest regional director for IMBA. "That Lutheran 'you gotta hurt' kind of mentality carries over into the mountain biking here. For so long, mountain biking in the Midwest was nothing but cross-country. It was about suffering. Then Aaron Rogers started building trails." Rogers is the mastermind behind Copper Harbor's aggressive trail system, and I don't use the term 'mastermind' lightly. He was the first trail builder to bring the concept of large-scale but sustainable flow to the region, a move that has sparked a trail-building revolution in the often-overlooked 'flyover' states. Rogers moved to Copper Harbor in 2005 to mountain bike and ski, and immediately began molding an overarching vision for the Keweenaw Peninsula. He wanted to build gravity-centric trails–trails so fun that people would drive to the upper end of Michigan to ride them. "My idea was to milk out the longest downhill you could possibly get," Rogers says. "Then, I wanted to make that downhill more fun with berms, jumps and rollers." At first, Rogers was building trails during his spare time while working as a bike mechanic, then the hobby turned into an obsession. "I just went out and started building trails on my own, all day, every day," Rogers says. "There was no income from it. I just did it because I thought it would be fun. It took two years before I started getting paid to do it." Rogers did his homework, enrolling in IMBA's Trail Building School and studying the nuances of purpose-built trail construction on a road trip through the Southeast with Johnson. 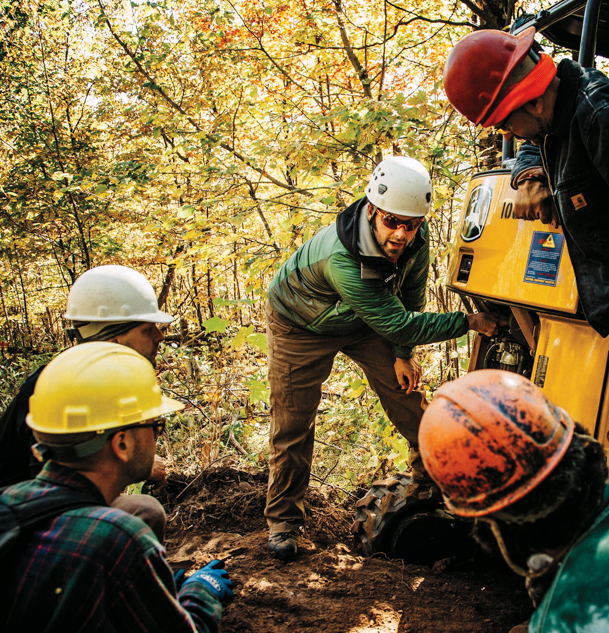 He absorbed lessons from flow-trail systems like FATS in South Carolina and adapted them to the bedrock-ridden, steep, fall-line-laden terrain of the Keweenaw Peninsula as he assumed the role of a professional trail builder, first for IMBA Trail Solutions and now for his own company, Rock Solid Trail Contracting. Building a trail that emphasizes downhill fun sounds simple, but for Michigan and the greater Midwest, it was a revolutionary concept that immediately resonated with people. In the 10 years since Rogers started shaping dirt and rock, Copper Harbor has grown from a local's secret stash to a legitimate mountain-bike destination, earning Silver Ride Center status from IMBA and drawing several hundred riders every weekend during peak season. "Until a few years ago, Midwesterners didn't travel to ride. There weren't any trails worth traveling for," Johnson says. "But when Aaron built Copper Harbor, I started taking mountain bike clubs from all over the Midwest up there to ride, to show them what they could do in their own backyards." It worked. Rogers is still building trails in Copper Harbor, but he's also shaping dirt all over the Midwest–knocking out pieces of the 100-mile Duluth Traverse or expanding the system in Cuyuna, Minnesota. More importantly, other clubs and trail builders are trying to replicate Rogers' style in their own patches of woods. "It's an arms race in the Midwest right now. I don't know that trail building is happening at this pace anywhere else," Rogers says, adding that the region was behind the curve for so long that Midwesterners picked up a bit of a complex. "For so long, everyone overlooked us. That motivated people to build quality mountain bike trails, and build them better than anyone else. We can build stuff that competes with just about anywhere." While a number of trail builders have emerged throughout the Midwest, it's rare to find a builder with Rogers' sense of imagination and attention to detail. "The day one of Aaron's trails opens, it looks finished," Johnson says. "The dirt is raked out, the brush is hidden in the woods … the trail is brand-new, but it looks like it's been there for 20 years. It looks like it's supposed to be there. His trails are like art." Look at any of Rogers' berms and you'll notice an engineer-like sense of precision. The cap of each wave is a perfect square, like it's been carved with an X-ACTO knife. It's a seemingly unnecessary, but beautiful touch. "It's like being a chef," Rogers says. "The presentation is as important as the quality of the food. That's what we're doing. We're trying to make everything look as good as it rides. If you have that aesthetically pleasing look, it's gonna feel like it rides better. I put those corners on berms because it gets people stoked." Rogers doesn't get to ride the trails he builds much. He spends most of the riding season working non-stop, manning an excavator in the Midwest and beyond. He flies home every chance he gets, taking 36 hours to see his wife and 11-month-old son. In the winter, he skis, snowboards and fishes, boring tiny holes in Lake Superior's chunky ice. When the ice thaws and the snow melts in the Upper Peninsula, it's time to build again. He has plans to double the mileage of Copper Harbor with a cross-country trail that runs along the lakeshore. He's also building a primitive campground and bike park next to the trails. And there are projects in Duluth, Cuyuna, Arkansas and Hawaii. He has toyed with expanding beyond his six-man crew, but ultimately wants to stay small. "I like to be a part of the work. I like digging," Rogers says. "If I grow too much, I'll just be a manager. I don't want to be a manager. I love being out in the woods, getting to experience nature firsthand, every day. I guess I don't believe in the inevitability of having a 9 to 5 job. I just want to do my own thing. Luckily, trail building has worked out.